Three men have been jailed in connection with killing 39 year-old Cambridge man Jeff Henry last summer. Anthony Kenny, 37 (left) and Martin Saunders, 35 (right) were jailed for a total of 38 and a half years at the Old Bailey for the manslaughter of Mr Henry. They'd admitted killing Mr Henry in June 2015 at the same court in May. 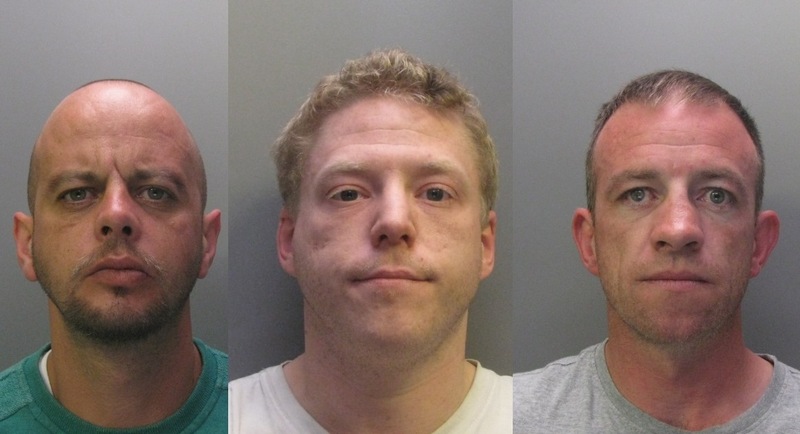 Ben Maguire, 29 (centre), formerly of Minerva Way, Cambridge, admitted conspiracy to commit GBH and assisting an offender and was jailed for four years and six months. The judge said he would have received 12 years had he not helped the police investigation. The court heard a feud had developed between Saunders and Mr Henry when the former became embroiled in the Mr Henry's failed efforts to rekindle a relationship with his ex-wife. Mr Henry was assaulted by Saunders and Kenny twice on June 7. The second assault, in Campkin Road, proved fatal. He had arranged to meet Maguire, who had then contacted Saunders and Kenny, knowing they wanted to assault him. Mr Henry was taken to Addenbrooke's Hospital, in Cambridge, where he remained in a critical condition with a fractured skull and traumatic brain injuries until June 12, when the decision was taken to turn off his life-support machine. Saunders, of Beaton Crescent, Huntingdon, and Kenny, of Burgess Walk, St Ives, originally denied killing Mr Henry and were due to stand trial but changed their pleas. Saunders was given 11 years for the conspiracy charge, six-and-a-half years for GBH and four years for perverting the course of justice, all to run concurrently with the manslaughter sentence. Kenny was given 11 years for the conspiracy charge, six-and-a-half years for the GBH and four years for perverting the course of justice, all to run concurrently with the manslaughter sentence. Detective Inspector Al Page, from the Beds, Cambs, Herts Major Crime Unit, said: "This was a cowardly attack. I am extremely glad that we have brought those responsible for Jeff's death to justice." "No sentence will ever be enough for what Ben Maguire, Martin Saunders and Anthony Kenny have done to our family by conspiring to seriously assault my brother, executing their plan, and then trying to cover up what they had done. They have destroyed the lives of so many by their actions, over something so petty and insignificant. In one night, 13 months ago, they took away a grandson, a son, a brother and the father of six children. There is no excuse for what they did to Jeff that night and the devastation they have caused, which we have no choice but to live with, and then will have to re-live, when Jeff's youngest children are old enough to understand what happened to their dad, and then we will have to watch them hurting and grieving. I sincerely hope that prison is the punishment it is meant to be for these three cowardly killers."